We all know the feeling of fresh and beautiful Short Layered Hairstyles. The hot look in summers is perfect to beat the heat and stay stylish. Of course, giving up the long hair look and jumping into the bandwagon of ‘short hair styling’ is something bold. We all have been inspired by Lisa Rina’s layered haircut and how many times have we promised to get one ourselves? This is the time to step ahead of your fears and get the Short Layered Haircut for the perfect dreamy look! The pointy layers would help to give the necessary shag and volume to your hair, while you can play with the dye, create highlights or low-lights, depending on your taste and the trend. We are here to help you accomplish all of this! 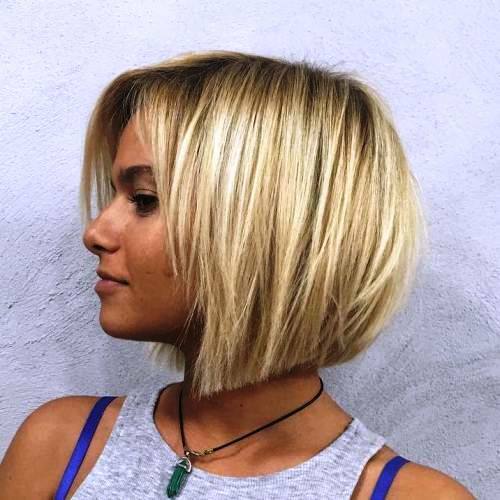 28 Stunning Short Layered Haircuts that Scream Hotness! In the era of women empowerment, nothing is more beautiful than being outspoken, bold and more charismatic by adopting styles and fashions that make the world your own ramp! 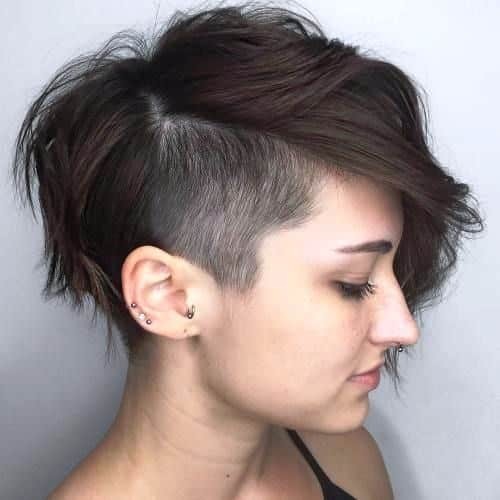 So, here we have some trendiest suggestions for you ladies who are seeking something unique and classy for a short layered haircut! Well, do you remember the lyric of Taylor Swift’s song STYLE ‘we never go out of style’. For fashion industry Bob haircut never go out of style. We have numerous modifications and numerous trends, all of them in the Bob haircut. 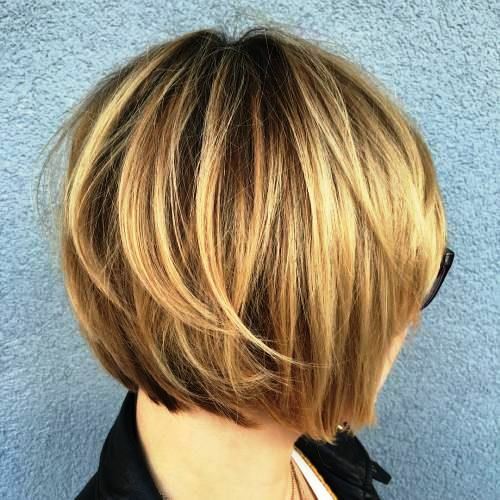 A layered Bob haircut is especially for women with straight silky hair. It is a perfect Bob hairstyle for day to day use, easy to maintain and very stylish to rock! 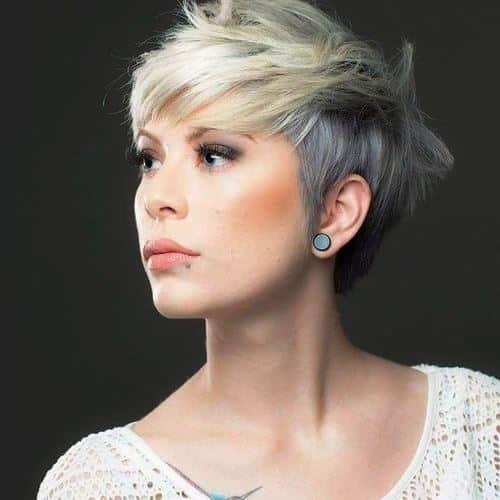 For the young, playful and energetic look layered pixie is the best of Short Layered Hairstyles suggestion. The sleek hairstyle is going to provide you the messy look you intend to have. It is time effective and does not take a lot to maintain. For the messy hair, no care look, we suggest the usage of any Texturing product and for formal festivities just slick it all back, and have fun. Check out Alexa Chung’s layered Bob to get inspired. Use Balayage in this look for the subtle hue and get it more customized based on the hair colors you want to play with! This look brings out the features of your face and enhances the delicate face contours, while standing out of its own. The feather cut, is one of the best Short Layered Hairstyles for Fine Hair. 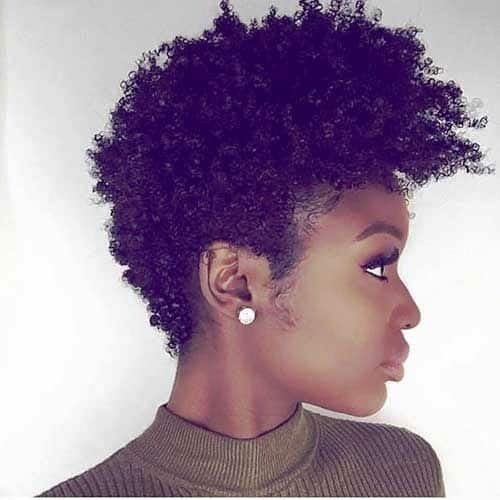 So, this hair style is a must have if you are transitioning from long hairstyles to the short hairstyles. Be confident that it will give you the swag! 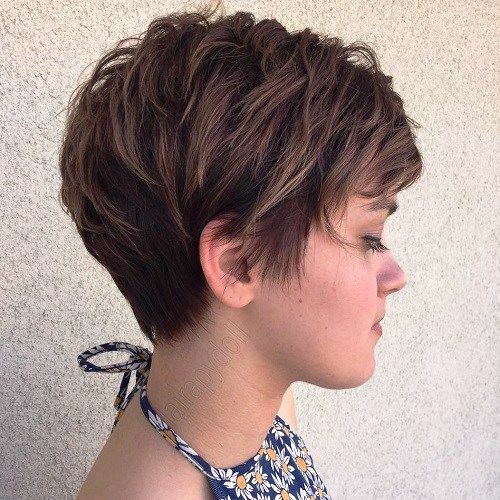 For a boost in volume, you got to try a layered pixie. The shag in the center is going to provide the density to your hair. 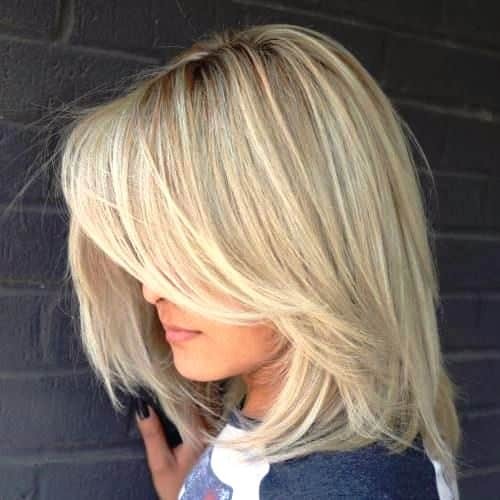 Use highlights of various shades of blonde to enhance the layers. 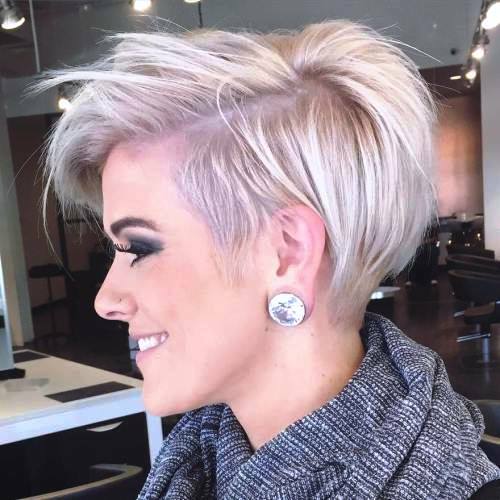 And this will prove one of the best Short Layered Hairstyles for your personality! Speaking of ‘I woke up like this’, the look befitting this statement is the messy Bob. The layers are tousled to provide volume and the ends are blunt. Again, we would suggest a Balayage for this look as it enhances the overall haircut. Feel free to play with the shades of blonde. 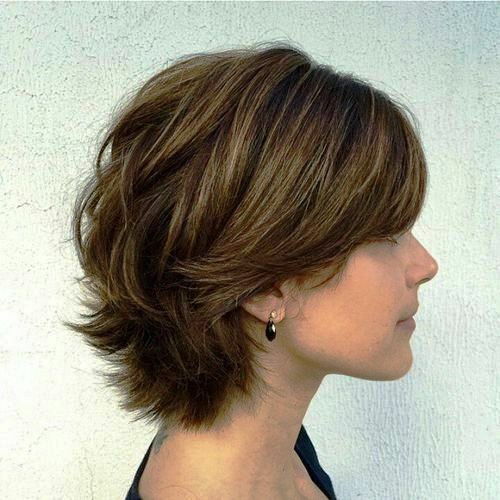 This Short Layered Hairstyle for Thin Hair is easy to maintain. Add cute clips or pins or let the strands to be free. The ball is again in the court of pixie haircut. Here, we are suggesting the women with thick hair, tired of the bulk of their head to try this light and fresh, trendy look. It is very short, however, very girlish. Wear shimmery pearls or shiny studs, in your ears with this delicate haircut, and enjoy this stunning Short Layered Hairstyle on the go! A combination of two of our favorite haircuts, in the list of Short Layered Haircuts for Fine Hair. This messy hairstyle is just the right one for the dishevelled look. Try it and do not forget to sing ‘I’m in love with the shape of you!’ when you look into the mirror. The benefit of having Short Layered Hairstyles is that they look super-duper cute, less demanding in terms of maintenance and are very trendy and flattering. The fringes swept to the side in this look are very chic. The shaggy, tall crown is going to make up for the length which got lost. Something for the women with natural curls! The fashion industry has played with the Bob haircut to our pleasure. 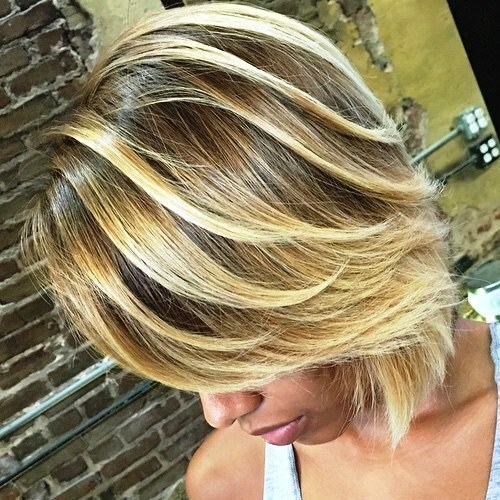 If you are unafraid, to let go of the length, then cut your Bob with uneven length. The irregularity is the style in this hairstyle. The front is longer than the back. If you have straight hair and you are opting for this hairstyle then use a curler to curl the layers the way Victoria Secret’s models do. You can have a duo-tone in this haircut. It is always fun to play with the dyes after all! If you are not up for the messy look and intend to have a tidy look with layered Bob, then try this suggestion. 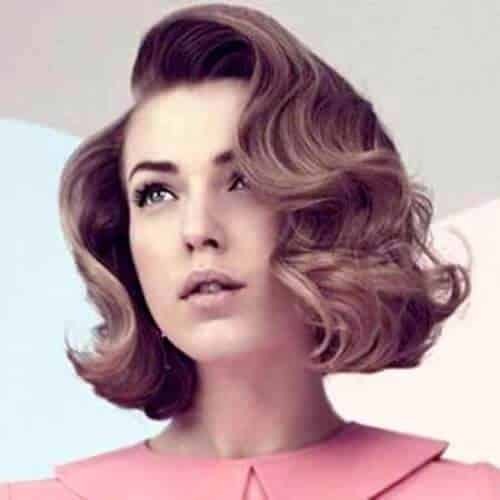 Cut your hair into a layered Bob with curling the ends inwards while styling the hair. This is going to give the neat and organized look. 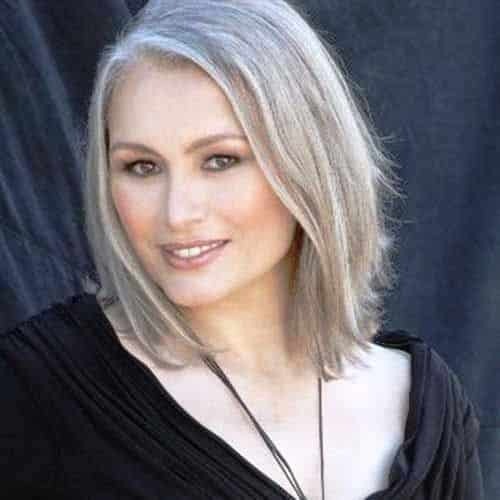 Keep the hair in the tone of darker shades. This is the perfect, girlish, neat Bob look. The fringes swept to the side give a very chic look in this haircut. 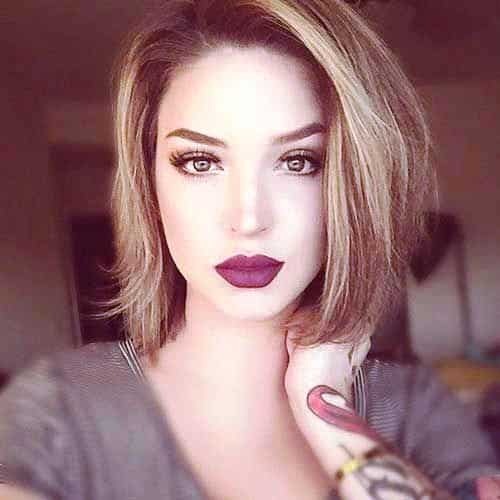 The plus point of Short Layered Haircut is that they are easy to maintain and do not create much burden of styling in day to day life, rather give a modern look in one go. The Bob haircut is evergreen. 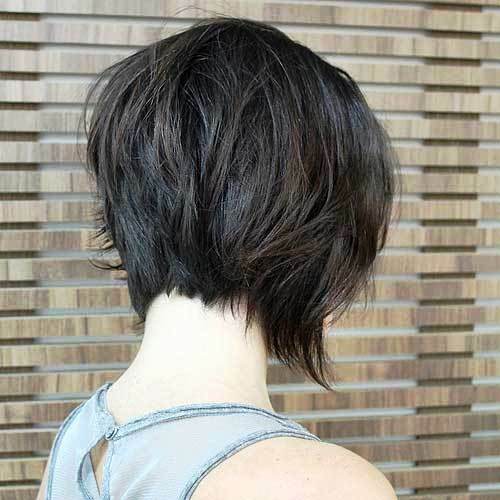 In Short Layered Hairstyles, Bob is all about layered hair, cut in varying length. The French dying technique gives this look a dual tone. While going out, you can use curlers to add loose waves. Just for the extra touch up, otherwise you are good to go with this fabulous Bob! The cute chopped hair in the front allows your hair to fall over your face. Go dark while choosing the hair tone: chocolate or deep blue. Make sure to use anti-damage hair products to keep the hair on fleek. 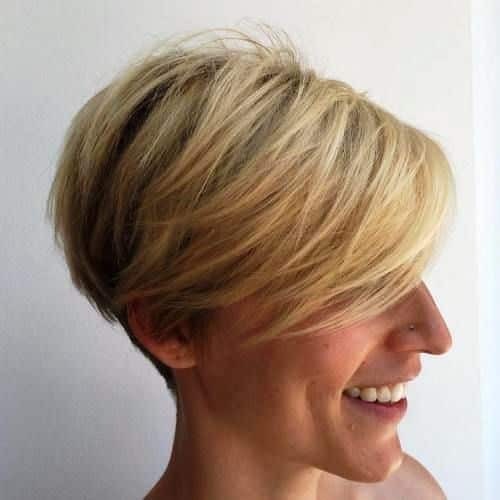 Perfect Short Layered Haircut for blonde lovers. Gives you a very sassy look! You can try this style while planning for a night-out party or any other occasion and you will rock the moment! There are various ways to have fun with Short Layered Hairstyles. From the chopped off layers to the huge list of hair dye, literally so much to do and so much to choose from! 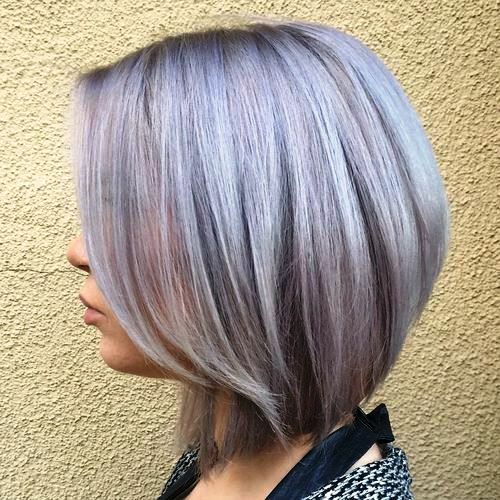 The purple tint, with platinum Balayage gives the signature look to your Bob haircut. The style pops out with the tinted roots. Try it, love it! The Short Layered Haircuts provide opportunity to get bolder with the hair color choice. This hair style, is perfect for opting highlights. It gives those beach waves, you have always admired, hoping to get one. Go an extra mile in your walk towards Bold and Beautiful and create disorderly waves to add the messy look of this haircut. The look that is all in one is the tousled Bob with bangs. For parties, for casual or formal use, for wild or tamed moods of yours, this Cute Short Layered Hairstyle is the perfect selection. 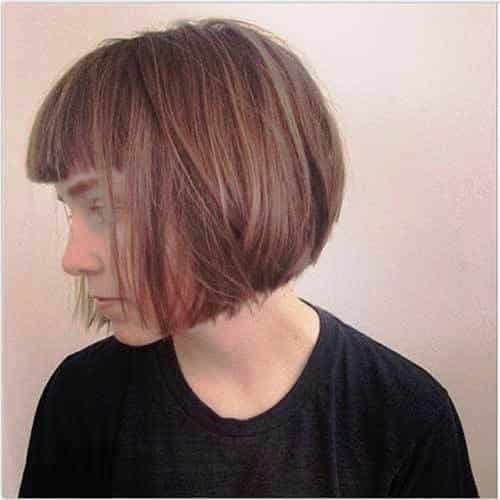 The hairstyles for bangs make this haircut more unique and classy. 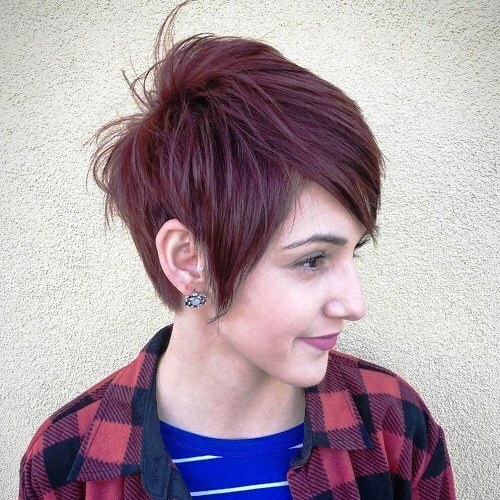 For an extra touch of edginess, play with the hair dye and angles of your pixie haircut. The lines of the coif are prominent in this haircut, giving it a very neat look. The contrast of the hair tone adds mystery. Not silver, not gray, not platinum either, but the ice, frosty white is your next signature look! Elsa white -yes, but in a shorter, more edgy look. 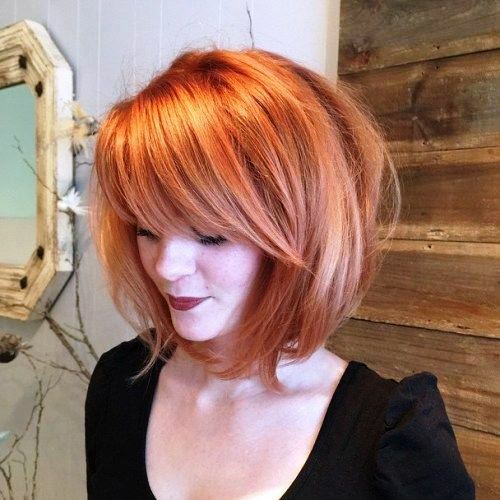 Add layers to make the dimensions of this short layered hairstyle more prominent. The waves always have a look of sophistication to them. The loose waves in this Bob haircut are perfect for women with slightly dry or thick hair. Add duo-tone to your haircut to enhance the lose wave for the beach look. Well, Bangs are love and we couldn’t resist but share this haircut. The bangs that fall over your face maintain a mystery, a perfect change for the aura you intend to create. 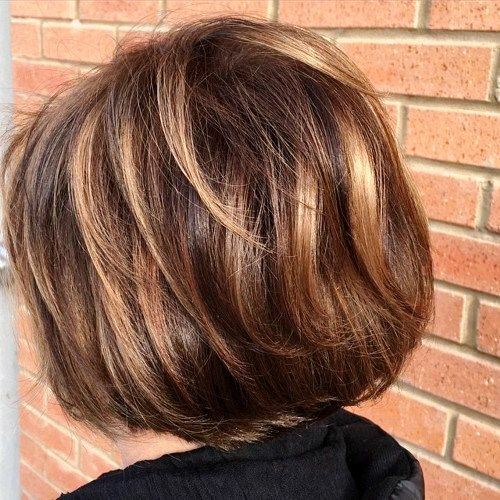 The root-lift in this very Short Layered Hairstyles round Bob, provides the volume to your hair that might appear to be lost due to the loss in length. An alternate for extra volume would be the volumizing hair products! 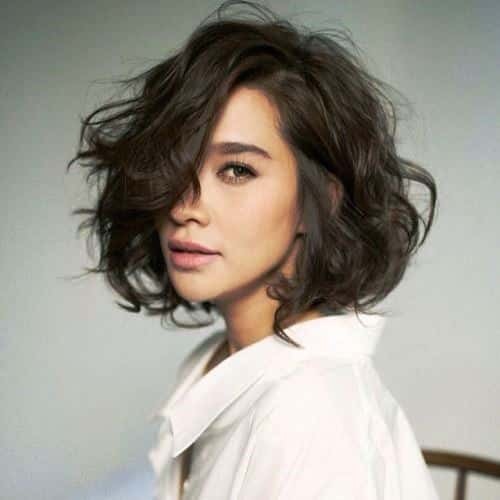 This is indeed one of the sexiest of the Short Layered Hairstyles! 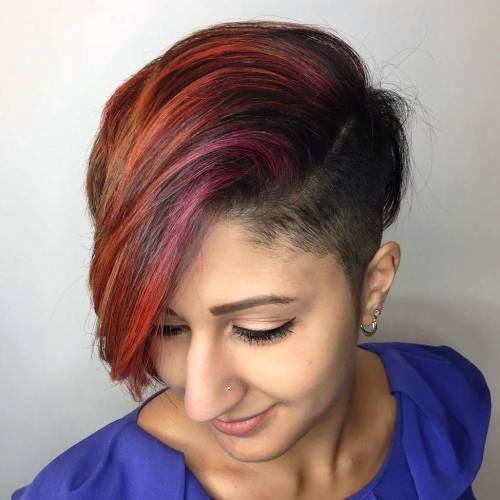 The chopped cute haircut looks fabulous with the contrast of two different colors. It is one of the hairstyles, that works for all types of hair texture. The dark and exposed roots create the edge in the haircut, which is all you’re looking for! 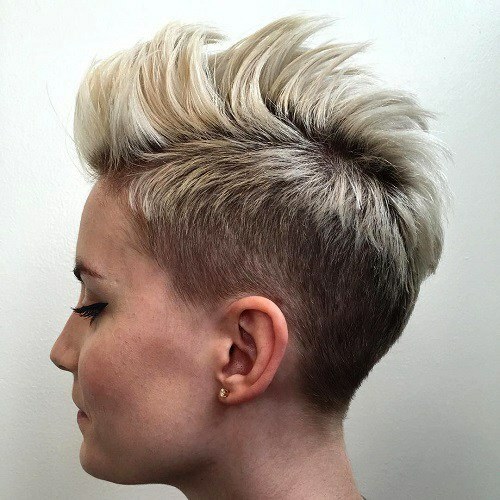 The temple undercut is adding the detail and creating the expression of ‘chic’ you want to have. 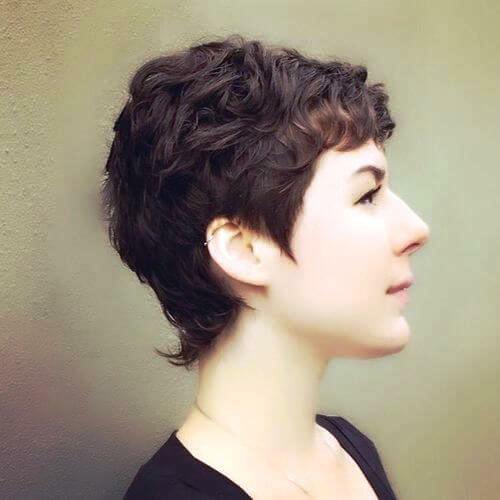 The stacked layered pixie haircut is cute on its own, with the undercut it gets hot! 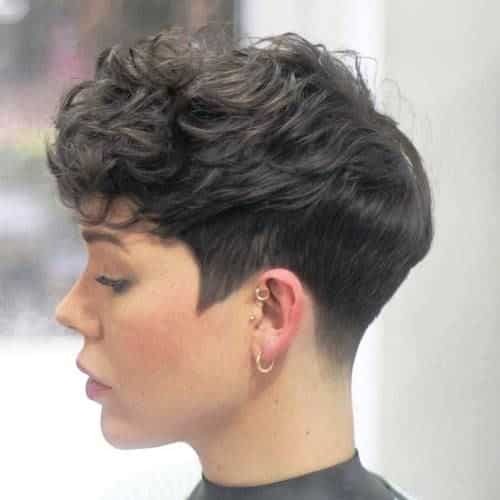 This haircut is for women looking for Short Hairstyles for Thick Hair. It is short, it is sassy, it is fabulous! The natural bend in your thick hair is going to complement with this haircut. The pixie haircut is alluring and a universal constant for cuteness. 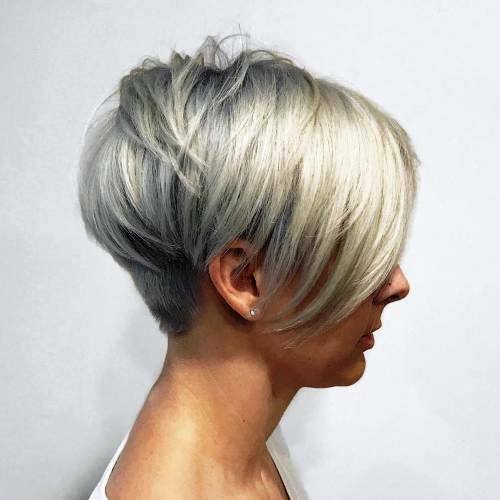 Playing with the mixture of colors and texture with your pixie is the more modern approach. Add a set of bangs to this haircut to create an enhanced chic look. For people with neck tattoos, this is perfect to flaunt and show off your neck engraving. The duo of chocolate and caramel is universally tested ladies! 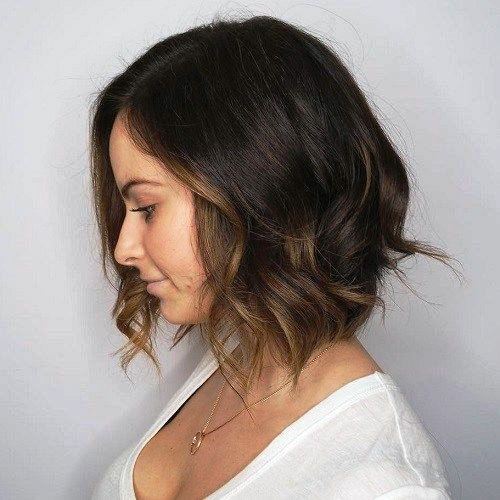 If you are not much into short hairstyles, then cut the layers of your Bob slight long. This provides the volume. 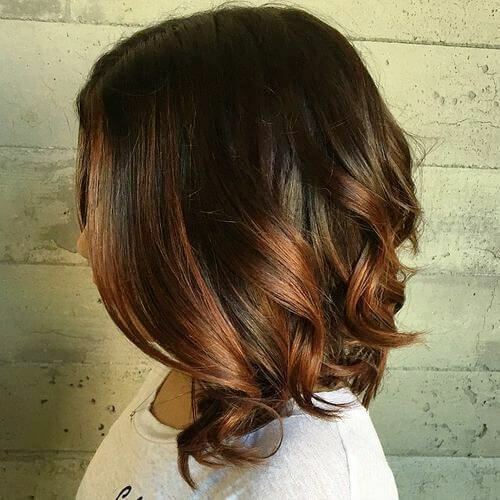 The subtle caramel Balayage will do the job of making you look deep and breathtaking. The haircut becomes ten times more exciting with a blend of nice hair colors. 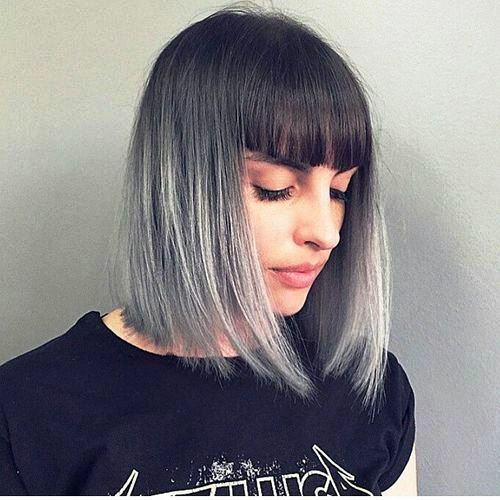 The mixture of gray and blue would just do that to your haircut. The pixie hair with this delicate mix of hair color is going to give a very delicate look. This is the age of woman empowerment. Our look, our attire, our getup, all speaks of what we feel about ourselves and what we want to world to feel about us. 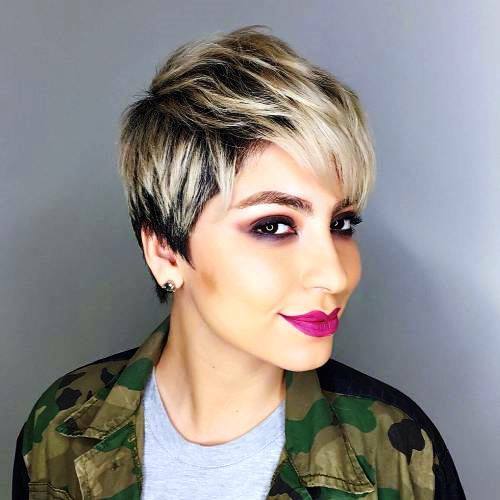 The Short Layered Hairstyles are all about fun and all about the bold look! Long gone are the days where long hair styling was the fashion statement. 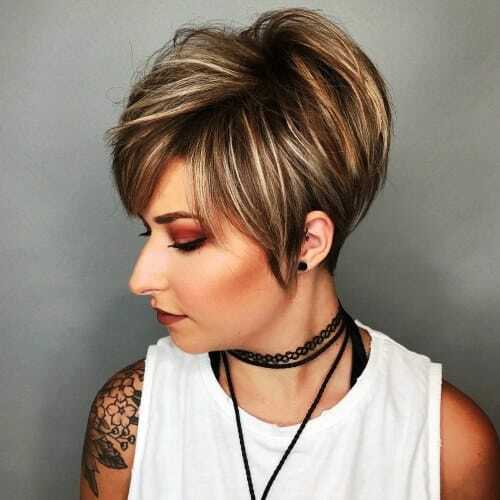 The variety of Short Layered Haircuts speaks itself on how much the fashion industry has appreciated the bold look of these haircuts and have adopted them for the modern look everyone is searching for. There is a lot you can do with your Short layered Hairstyle and this article is meant to emphasize just that. From playing with the angles and length of your hair, to adding tones with various shades available, from creating highlights and low lights or a simple Balayage, the list is long and satisfying. Life is too short to have boring hair after all.